I starting showing an interest in music in the age of five. My studies started with Cello and piano. Since graduating with distinction from my studies, I started playing with European orchestras, chamber groups, won prizes in competitions. Having studied with renowned international cellist Natalia Pavluskaya in Trinity college of music I gained PGA diploma in performance studies. Since then a vast experience of performing in concerts and doing masterclass with distinguished musicians such as Richard Lester, Gordon Back, Alexander Ivashkin. 20 years of experience as cello teacher. Cello teacher one by one in Thomas Jones school. 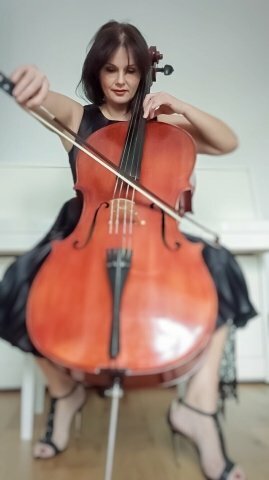 Private cello tutor for 20 years. I teach with any age group, from as early as 2 1/2 and adults. I teach every level with the best achievements. A very successful cello teacher and player! Always approaching my pupils with passion for them to learn their easiest and best. My pupils have won scholarships, competitions and distinctions in cello exams and auditions. Recently my pupils have been excepted in Guilhall school of music and drama. I’m a hard worker and always there for all of them. BrikeldaFrom Vera (5/5): Brikelda is an absolutely excellent teacher. Our son has made so much progress in such a short period of time… and he even practises after his lessons! Brikelda is encouraging, empowering, and ambitious for her students. We are so glad, and lucky, we have found her!